Rainy season is approaching in Tokyo, so it was no surprise we woke up to scattered showers and gloomy skies. Nothing could break our spirits though! Umbrellas in hand, we braved the pouring rain to continue onto our planned day. Our trip for the day had 3 main destinations, each one visiting diverse groups of people living in Tokyo. My project focuses primarily on how nationalism affects Koreans living in Japan– not simply through an understanding of diplomatic tension, but through analyzing how the average person feels the effects through everyday life. Most of my project is conducted through in-depth interviews and observations, which made today’s excursions to meet lesser-known groups in Tokyo exciting. We started off our day at the American School in Japan, a high school located in Chofu City, Tokyo. The school follows American curriculum and closely resembles a stereotypical high school in the United States. With 98% of all ASIJ graduates going on to attend college, the school is ranked as one of the highest ranked international schools in the world. 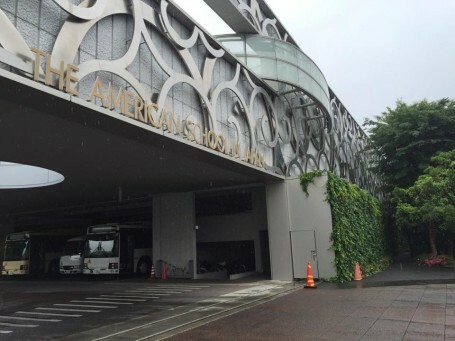 The American School in Japan on a rainy day. We were given a tour of the school by 4 ASIJ students who were also Fall 2015 USC admits. Roughly 38 nationalities are represented within their K-12 grade system, which gives the students a uniquely diverse perspective within a homogeneous society like Japan. A significant amount of their student population is Korean, which was relevant to my topic on the effects of Japanese and Korean nationalism on Korean immigrants. Through interviewing students on the campus, speaking with a teacher of the high school, and observing the school’s social dynamics, I learned a lot about how nationalism affects the small group of Koreans attending the ASIJ in Japan. 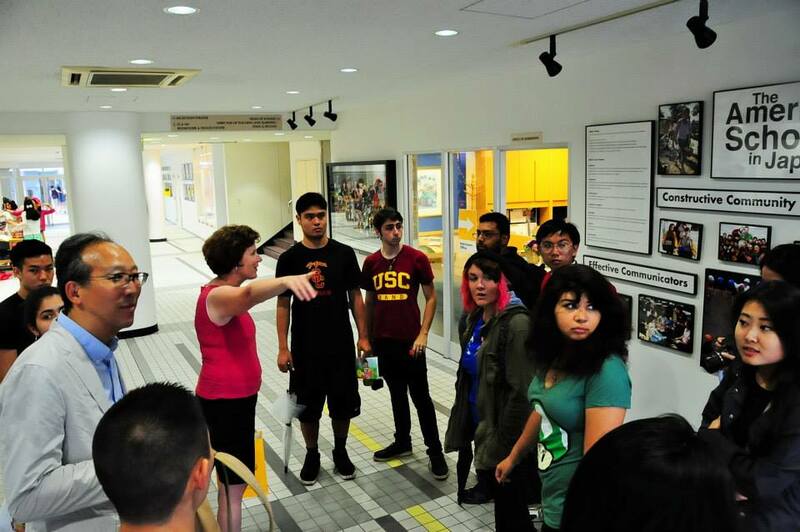 ASIJ teacher Kathy Krauth pointing out the clean and sleek facilities inside the ASIJ High School. Following this, we traveled to Joseon, a North Korean School. Somewhat contrasting the American School in Japan, Joseon placed significant emphasis on maintaining Korean roots, heritage, and pride. Recently the school has faced much protest and discrimination due to their ties to North Korea and as Zainichi-Koreans. Diplomatic tensions between North Korea and Japan as well as Japanese ethnic nationalism have played a large role in the school. We were able to interview the Vice Principal of the school and 4 students who talked about their sense of pride in culture and heritage, their awareness of discrimination, and their experiences living in Japan. The discrimination that they face on a daily basis reflects the general anti-Korean sentiment present across Japan today. Not all people living in Japan share this anti-Korean sentiment, but it’s clear through protests and demonstrations that this feeling exists. The trip was eye-opening and showed a real example of how intense nationalism can in some ways be damaging to groups of people within a nation. 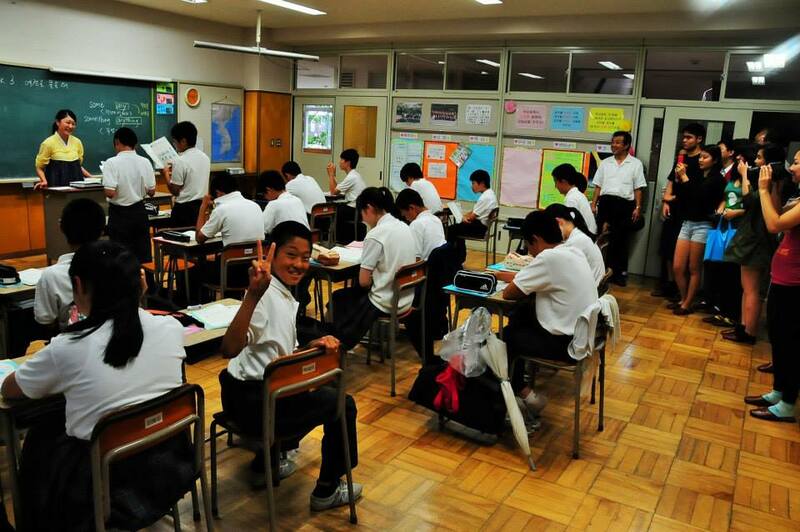 A look inside the Joseon middle school classroom. The kids are learning English. 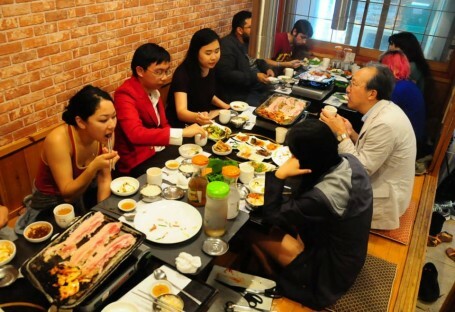 Following our event in Joseon, we traveled to Shin-Okubo, Japan’s Koreatown, where we enjoyed a crazy elaborate dinner of Korean BBQ, abundant side dishes, ddukbokki, bibimbap, and soups. An array of side dishes, Samgyupsal meat on the grill, and a choice between tea and water cluttered our tables at dinner. The highlight of the evening was being able to interview the waiter (in Korean) about his experiences living in Koreatown, what brought him to Japan, and his insights to discrimination in the country. He was incredibly thoughtful and hilarious in his answers, often considering the different aspects of both Japanese and Korean culture. He handed me a 5-pack of Shin Ramen (A well-known Korean brand of ramen) on our way out with a wink. 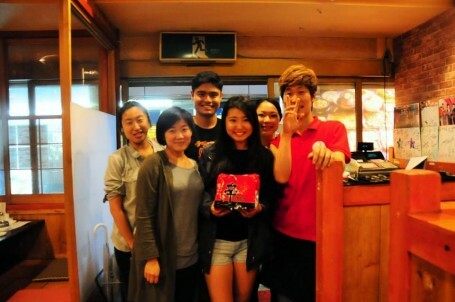 The Shin-Okubo restaurant manager ‘Fighting On’ with us. Despite the crazy rain, we enjoyed an action packed day where we were able to experience Tokyo in different ways. As much of my project is based on in-depth interviews, I found today to be an invaluable opportunity to meet people one-on-one. For future travels on this trip, I hope to continue to experience these unique aspects of Tokyo and the amazing people the city has to offer! 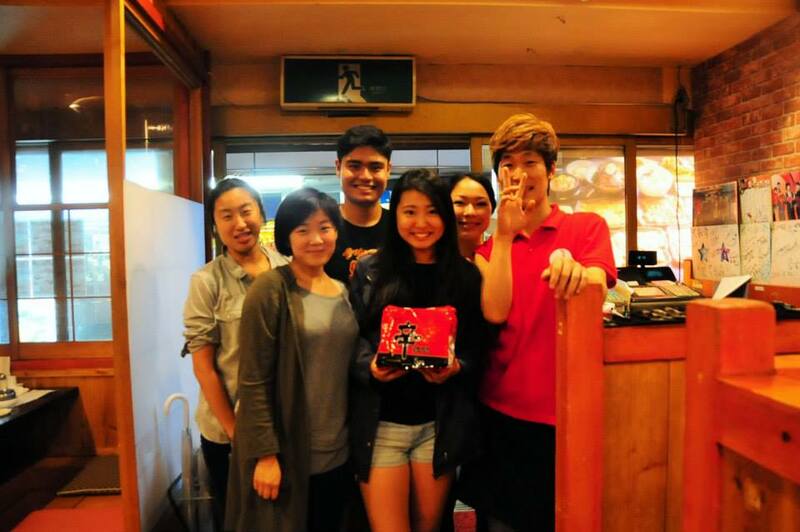 This entry was posted in Class, Culture, Exploring, Tokyo, Travel by geajapan. Bookmark the permalink.